Quid novi ex Africa? | What’s new from Africa ? I hate politics. Hate everything which is even slightly related to the politics. Nevertheless these days as all of us I am watching the Egyptian drama unfolding. Before that it was Tunisia… As I watch those seemingly powerful regimes falling apart after decades of ruthless ruling as house of cards I wonder why? Since I hate politics, I am not interested in governmental policies, opposition movements or revolutionary tactics which have resulted in such grandiose state collapse. I take philosophical approach rather than analyzing ephemeral details of political activism; and being an architect I find some quite interesting analogies between the world order and the building design. Any building structure consists of 3 basic elements. Of course I simplify things, but this is not about my beloved architecture but about hated politics. Foundation is the most important element; it is a basis of everything. Foundation supports all other components. There is no building without foundation, even though this is not the most visually dazzling and practically usable building part. Structure is next in the hierarchy of the building science. Main structural members are columns and beams. There are many other members including supporting walls for example, but let’s keep it simple. Structure is a skeleton of the building and that’s what matters. Building envelope defined by the walls and the roof is a third “pillar”. Obviously this is the most visually prominent building element. In terms of the building science envelope is the least important part. It can be easily changed or re-done. Usually it is self-sustaining. It has no fundamental qualities, since it doesn’t support building loads. Envelope is not directly responsible for the structural safety and integrity of the building either. Nevertheless envelope forms the exterior and the interior of the structure. And in terms of the human interactions those are the key things. Interior is the environment where people actually live (house), work (office), rest (community centers), etc… Exterior means facades. Facades (or elevations as architects call it) give people an idea of how the building looks like from the outside. Now let’ take a look at the modern society. Elements forming a structural safety of the human society are security forces. Army, police (and other military/paramilitary services) protect society from the destruction just as structural members make sure that building is safe and sound. By the way security forces suppose to be under the government control just as foundation eventually takes all those building loads from the structural walls and columns. Façade of the society provides a nice picture for the tourists. Impressive Egyptian pyramids, beautiful antique ruins in Greece… This is a wonderful tourist shot which is not always telling the true story of the society members. I am sure that oppressed Egyptians and unemployed Greeks know a little bit more about the real state of affairs in their house than the tourists enjoying the landmarks. If the foundation is flawed the structure sooner or later will collapse. Once the structural flaws of the foundation will reach some critical level nothing can prevent the fall. At the certain point structural members (which can be in pretty good shape by themselves) might start shake and deform. Subsequently the beautiful newly re-painted façade with those fancy brand-new windows and elaborate decoration will fall down exposing the real atmosphere inside the house. The backstage behind the theatrical curtain. And it might be not as fresh as the new paint on the exterior walls. It might be smelly and dirty… You know what I mean. 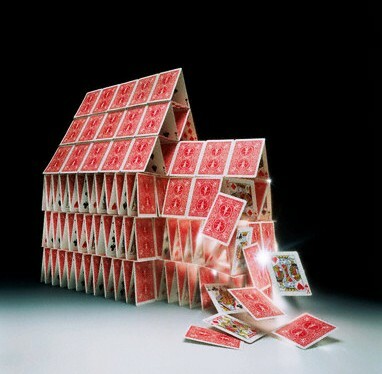 If such a house collapses it will be no surprise for the professionals. Engineers, architects, technical specialists have probably warned the owners years before it happened. Foundation defects are not to be repaired easily. It takes a lot of work, a lot of time, a lot of money… and at the end nobody sees it. So to patch those cracks on the exterior walls and to cover the moisture under the fresh layer of paint is much easier and more appreciative by the visitors. You can’t do this forever, though. The cracks will come back as well as the dampness will resume because your foundation is bloody rotten. So you better stop fooling yourself and make sure you fix it before it’s getting late. My allusions are obvious, aren’t they? One last detail. We all know that the modern world is driven by the economy. Political game is just a derivative of it. (Above I have defined “State” as an economico-political formation. Economy comes first!) So as US political system is watching the fall of the corrupted rotten regimes in Tunisia, Egypt and is arrogantly asking about who’s next… maybe it should take a good look into it’s own basement. It’s kind of smelly down there. 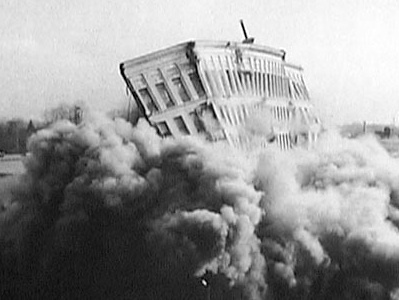 Printing dollars for the failing banks and pretending that stock market is a real economy might be just like re-painting the façade… But for how long it can last before the game is over? P.S. By the way political term “fundamentalism” sounds very architecturally. Don’t you think so? Your statements result in fresh approach to actual facts. IT is interesting to see also Egypt economic history. In XIX century, this country was involved in finance tricks. This country receives loans to buy harvest machinery for cotton from England banks and this result in a big debt. The harvest fail and the cotton prices don’t help. The debt was paid with taxes to traditional harvest of datils. 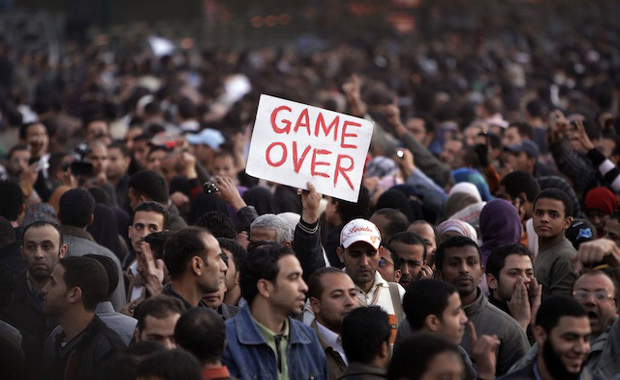 Egypt passed year decades in misery and hungry. This country knows finance speculations and his results. This can be viewed in the book “Capital accumulation” of Rose Luxemburg. Regards. Thank you for a brief economic discourse, Frank. many people see politics as nothing more than organized crime. The one who’s served it’s purpose; the rest of us still have things to learn. If you want to know the past, watch the oldest. If you want to know the future, watch the youngest. Obviously Egypt is no exception. I didn’t know about Croatia, but as I have been working on few projects in Ukraine & Russia I wouldn’t say the situation there is much different. Now think about the state of the financial system in US (financial system is the backbone, the foundation of the American society). It maybe even worse. And this is really scary. Congratulations Albert for your page and your smart comments. Politics and Architecture were always in relation, we architects need politicians and they need us, but we have such different objectives that the conflict is served in any occasion. We both depend of Economy and this “master” always wanted disciplinated people doing exactly what they want, so I think that the actual situation of crisis will not end until other people who make the rules really want to change things, what we architects can do is very small. Don´t forget that in this critical times many people is doing good business being cheap for the future, so this people do not want that the things change. We can only intend to survive, seeing how many of our fellows fall around us, I always ask me ¿when will be my time to fall?